Swarovski Multi Colored Crystals Single Crystals Framed in 22k Gold Plated. The value of & Good Quality for Jewelry is very important it give you Sophisticate & elegant look. SWAROVSKI are the best! 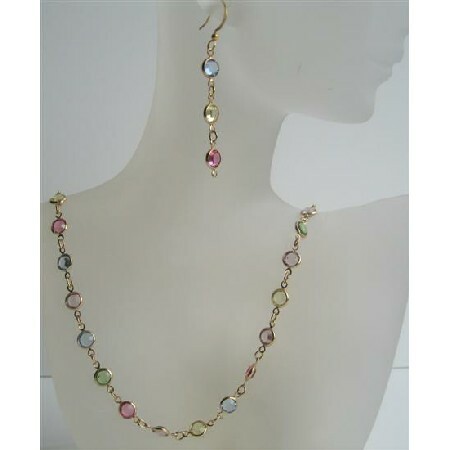 Nothing shines sparkles or dazzles like genuine Swarovski Multi Colored. This is one made with better craftsmanship or finer components. These handmade beaded accented & framed in 22k Gold Plated Necklace & Earrings are handcrafted with 100% Swarovski Austrian Crystals Swarovski darling Crystals. This beautiful & dramatically elegant is is one made with better craftsmanship or finer component.